Healthy, gluten-free, guilt-free alternative to traditional wheat flour roti/chapati. 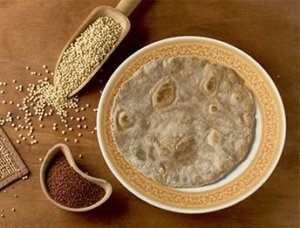 Gluten Free Flour is a healthy, gluten-free, guilt-free alternative to traditional wheat flour roti/chapati. It is made from assortment of whole gluten free grains. 1.Gluten Free Flour has been specially formulated to replace gluten (wheat protein) containing whole wheat flour. This is especially beneficial for people having gluten-sensitivity. 2. In contrast to multigrain atta available in market, gluten free flour has goodness of 5 different whole ingredients, with zero percent wheat. Gluten free flour contains all the nutrients like protein, fibre, etc. similar or superior to whole wheat atta but without gluten. 3. The millets are good sources of protein, resistant starch, vitamins, and nutrients such as iron, calcium, phosphorus, potassium and hence known as nutri-grains. Rich in antioxidants they also have low GI (<55). 4. Normal atta is not good for gluten-sensitive people. They might experience symptoms like migraine headaches, skin rashes, acne, joint pain or numbness, fatigue, forgetfulness, diarrhoea or constipation, gas, bloating and cramps. Gluten free atta is a boon to such individuals. 5. Millets are a rich source of magnesium, which acts as a co-factor for more than 300 enzymes that includes enzymes involved in the body’s use of glucose and insulin secretion. 6. The fibre in the whole grains support weight loss as the fibre leads to feeling of fullness for a prolonged period of time and that prevents you from unnecessary eating. 7. Insoluble fiber present in millets accelerates intestinal transit time, reduces the excessive secretion of bile acids, which can lead to gallstone formation, increase in insulin sensitivity. It also lowers the level of triglycerides. 8. Foxtail millet is rich in antioxidants which removes all the acidic elements away from the body, fibres in it controls blood sugar levels and bad cholesterol. 9. Psyllium contains soluble fiber that reduces appetite, improves digestion and provides a feeling of fullness, avoids unnecessary munching and hence it’s ideal for weight control. 10. Millets are beneficial in detoxifying the body, helps prevent type 2 Diabetes, reduces hypertension, bad cholesterol, eliminates constipation, excess gas, bloating, cramping and hence helps you to stay slim and healthy. 11. Soluble fiber in guar gum lowers blood cholesterol by reducing cholesterol absorption from your small intestine. Guar gum also slows the rate of starch digestion and glucose absorption following a meal, leaving you full for a longer time post-meal.